At Scout Mortgage, we’ve been providing low mortgage rates and great service for nearly two decades. With the end of the year just around the corner, we’re happy to announce that in a few short months we’ll have been doing what we love for 20 years. We couldn’t be happier about this! As your go-to Scottsdale mortgage brokers, our team is here to help your homebuying experience go smoothly. And it’s with that in mind that we’d like to share a bit of helpful advice in today’s post. We have your back when it comes to the whole financing your home side of things, but sometimes people need a bit of advice about what to do after they move in. If you’ve ever bought a home before, you know that there are a lot of moving parts. That means that it’s easy to forget about certain things. It’s understandable! 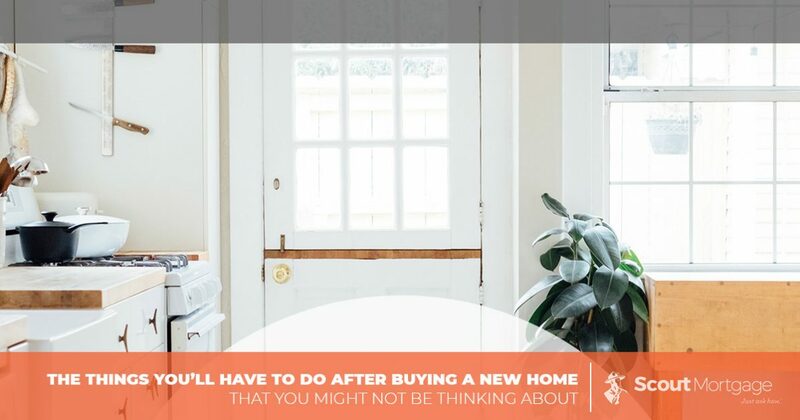 Fortunately for you, we’ll be discussing a few of the things you’ll have to do just after purchasing a new home that may have slipped your mind. Keep reading to learn more! No one likes the feeling of living inside a fishbowl, but that’s sort of what it can feel like when you live in a home without any window coverings. Although many homes do come with coverings on the windows, it’s also often the case that they won’t. That means that you’ll have to figure out what you’re going to do to make sure that your home has some privacy. Whether that means blinds or curtains is entirely up to you, but make sure that you set aside some time to look at patterns, purchase curtain rods, and determine the height and width of the coverings you’ll need to buy. Once again, some homes will come with appliances and others won’t. Some will come with a few appliances and you’ll have to take care of the rest. Thankfully at this time of year there are many sales, ensuring that you can get a great price and outfit your home with the best. No matter your situation, you probably have a fair amount of art around. It’s important to start thinking now about where you’re going to want it in your new home as well as how you’re going to hang it. It’s easy to think about moving into a home, but it’s easier to forget about the details, so having a plan of attack can go a long way towards making your new space feel complete sooner. If you’re in need of mortgage services because you’d like to buy a home in Scottsdale or the surrounding area, our team of experts can help! There’s nothing we love more than helping to get people into the living spaces they’ve always wanted to be in, and we’re here for you every step of the way. Contact us today to get the process started. We look forward to hearing from you!